Shriram Automall India Limited as a part of their endeavor to reach out to all the customers throughout the country is sprawling in every nook and corner of the country through 70+Automalls and 150+ bidding locations. SAMIL strongly believe in building relationships through multi tasking services and platforms which makes the company an accomplished asset to the market of pre-owned vehicles and equipment. Recently company which is a 100% subsidiary of Shriram Transportation Finance Company (STFC) joined hands with SBI on 10th October, 2017 in Mumbai for Its SME Segment. Company is already a big hit for being the no.1 serviceprovider for acquiring and disposing used vehicles and equipment offering negotiated deals with complete transparency through diversified bidding platforms. Now company with its tie up with a well known financial institution, marks a successful commencement of its association with the bank and extends the benefits of its holistic solutions for the disposal of all types of pre-owned vehicles and equipment. 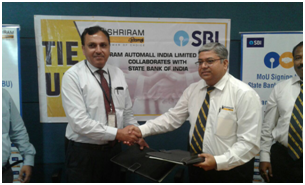 Under this alliance, Shriram Automall will cater to all the segments of the State Bank of India, including pre-owned commercial vehicles, construction equipment three wheelers and twowheelers. State Bank of India will gain utmost benefit of SAMIL’s one of its kind facilities as the service provider will certify the market value of every vehicle while helping in making the optimal decision. Moreover, the 24*7 parking facility will ensure safety of vehicles and refurbishment facility will make sure to get the maximum value on used vehicles. One can simply visit the nearby Automall, and experience the best him/herself. In the fast moving world, where luxury is the major demand, company has also launched “MY SAMIL App” & facility like “DESKTOP BIDDING”, for its customers by which, interested buyers can participate in the live bidding events from anywhere and everywhere. If you as well is looking forward to acquire or dispose your most possessed asset, SAMIL is the best choice to make. Simply visit your nearby Automall, or download “MY SAMIL APP” to go through the vast inventory they have for you. You can also click the link below and register yourself and go through the huge line up of segment they have to offer right now.